See Register for the Hardware Program for the detailed instructions on the registration process. See Managing User Roles for detailed instructions. Note that the initial version of the OEM Custom package is set to 10.0.0.0. 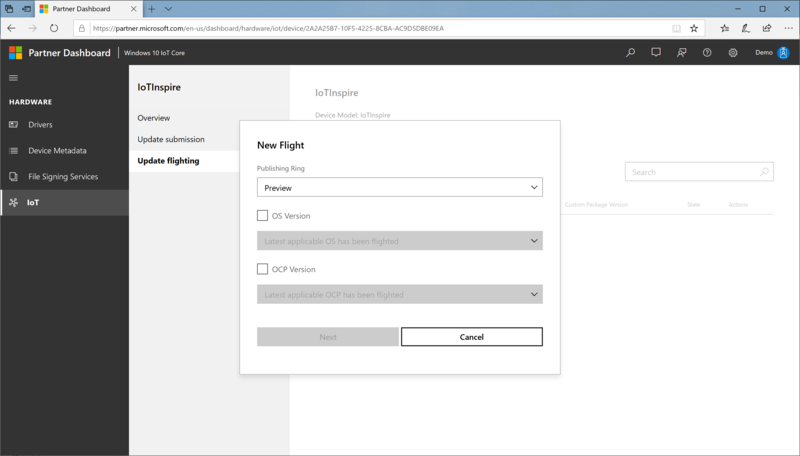 Configure the EV certificate used in the Device Update Center and the code signing certificate in the Workspace. You can use the same EV cert used for Hardware Dev Center or get a different one for code signing purpose only. It is recommended to keep a separate certificate for each purpose. Provide the SMBIOS information when prompted. For Qualcomm, this is stored in a SMBIOS.cfg file. For other platforms, you will have to update the BIOS to reflect these values. System Product Name, referred in the update portal as Device Model. Base Board Product, referred in the update portal as Hardware Variant ID. 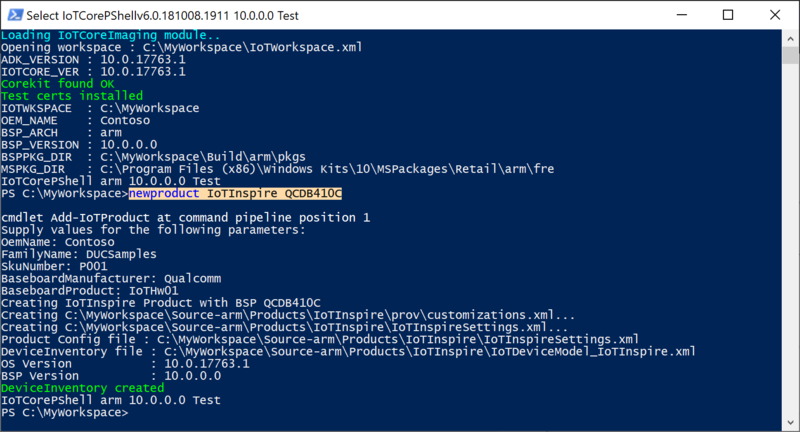 Note that IoTDeviceModel_<productname>.xml is also created. This is used to register the device model in the next step. 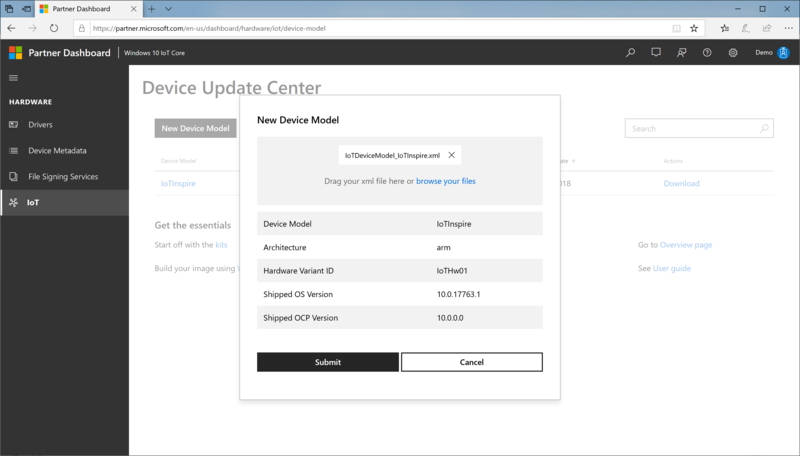 In the Device Update Center portal, select New Device Model. 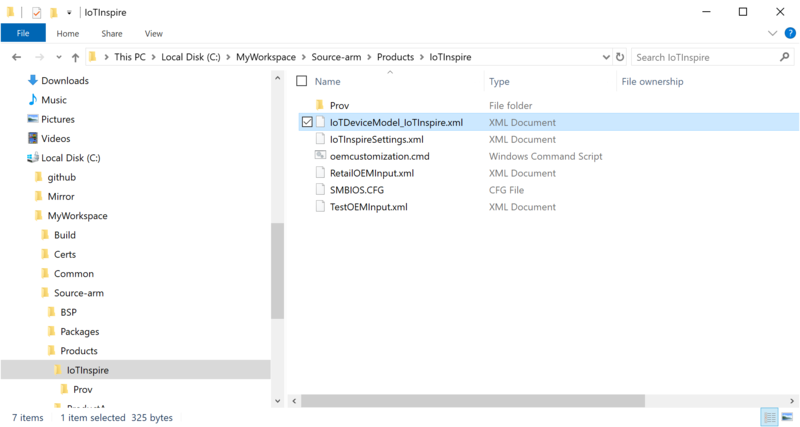 Browse your files and select the IoTDeviceModel_<productname>.xml from your workspace. Confirm the device model specification and press Submit. A new device model entry will be added to device model table. You will also see a download link in that table. This will also edit the OEMInputXML files for the inclusion of required FM files and feature IDs. This also removes IOT_GENERIC_POP feature if present. 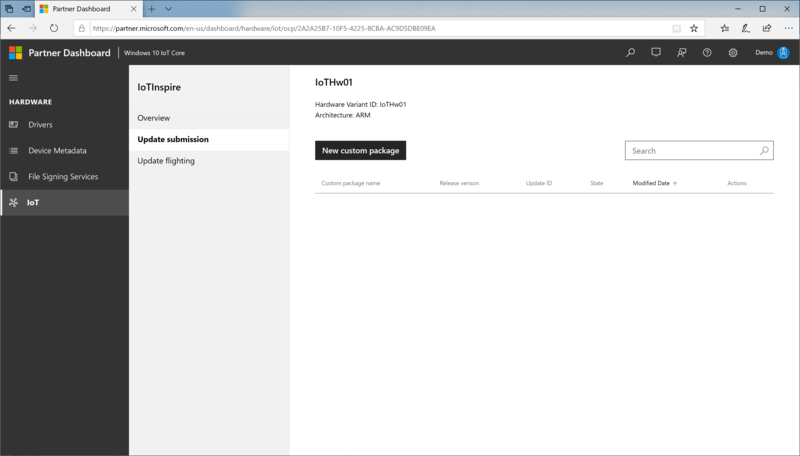 This gives you the base image with the OEM custom package version 10.0.0.0. Validate this image on the device. So far, we have created an updateable image which can be used to manufacture and ship the devices. In this step, we will look at the procedure of creating update packages and publishing it in the portal. Make sure that a.b.c.d is higher version than the previous version set. If new versions of BSP drivers are available, copy them to the BSP folder setup earlier (example, C:\BSP). Alternatively, keep all the updated drivers in a different folder, for example, C:\BSPv2 and update your workspace xml. If there is an new version of the existing appx, create new appx with the same name. 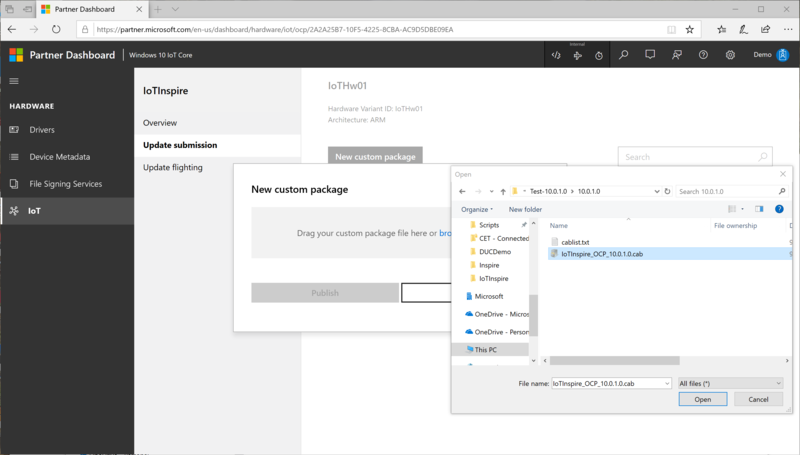 Note that the ID in the generated customizations.xml will be the same as the earlier version. If updated versions of drivers are available, update both the binaries and the packaging xml file. Update any other package contents as applicable. This gives you the base image with the OEM custom package version <a.b.c.d>. Validate this image on the device to make sure the device boots with all updates included. <productname>_OCP_<version>.cab will be created in the <workspacedir>\Build\<arch>\<productname>\<config>\<version>\ folder along with <productname>_OCP_pkgver.txt file that lists the cabs included along with their version information. This cab will be signed with the EV cert configured in the workspace xml. 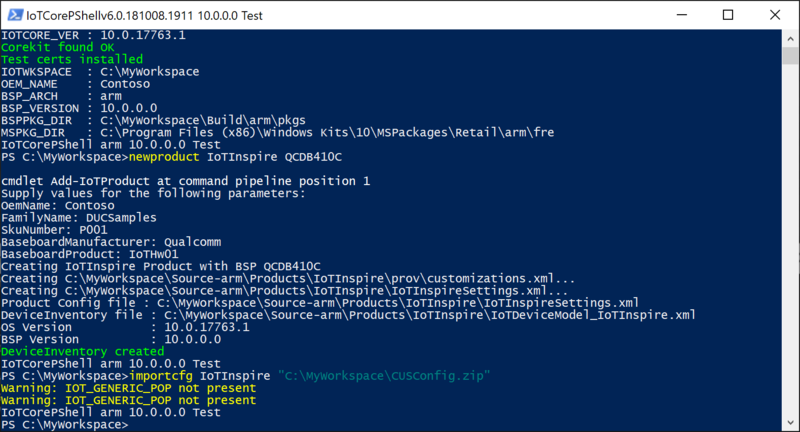 Browse your files and select the <productname>_OCP_<version>.cab from your workspace. Confirm the release version information and press Publish. You can check the status of the publishing process by clicking Status link. This process takes some time to complete. 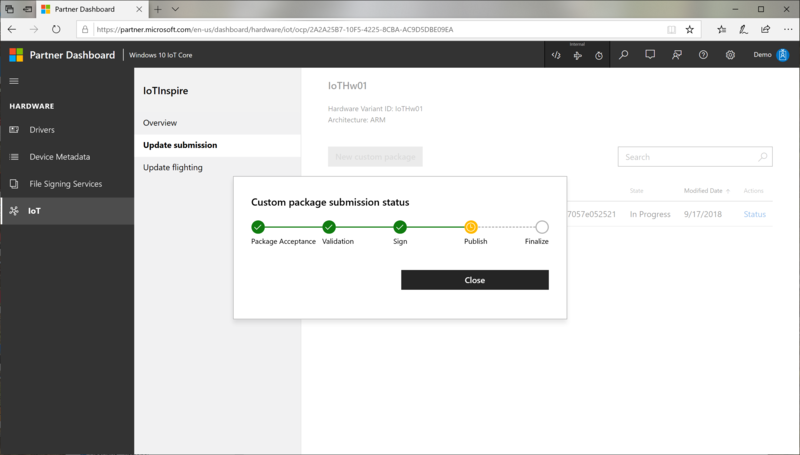 After successfully publishing the updates, you can now control the delivery process by specifying the targeting rules. You can check the status of the publishing process by clicking Status link. At this point the Windows Update system is set to deliver the required update packages to the device. It can take few hours before the settings are propogated. Now that the updates are available on the Windows update, you can validate the updates on the device now. The rings are provided to enable staged roll-out of the updates, starting with Preview, then EarlyAdopter, then GeneralAvailability. 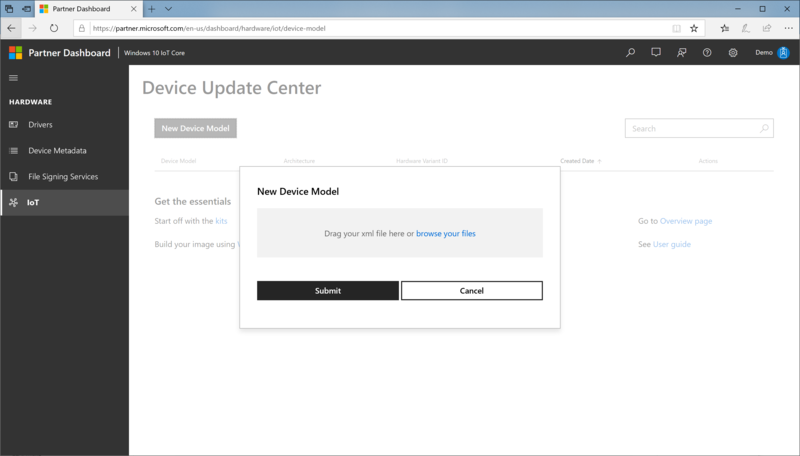 Let the device scan for update, the device will detect the published update, download and install automatically (based on the update policies configured). This process may take 24 hours or more depending on the scan time and active hours settings.